Those of us who treasure Three Sisters Springs in Crystal River, Florida, were excited to see the springs re-open on November 15, 2016. It has been 7-1/2 months of construction by the Southwest Florida Water Management District and their contractors. 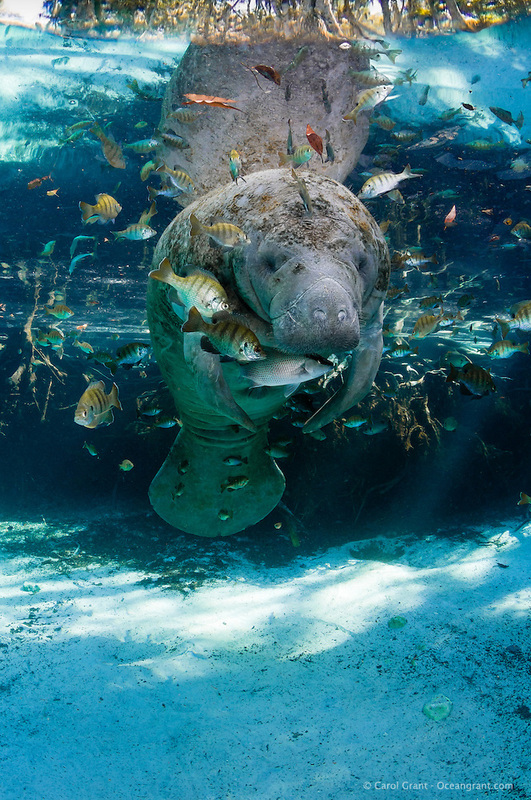 Three Sisters Springs has been closed to the public and manatees the whole summer. Here are some of the pictures I took and observations during my first manatee day this season in the springs. My First Manatee in Three Sisters Springs Right After it Opened After 7 Months of Shoreline Restoration! Because of Our Enormous Super Moon Tides, Wind and Other Factors, Visibility Wasn’t the Best, But These are Some of My Better Photos from November 15th. ***(Note: because my computer is in for repair I downloaded these RAW photographs and edited these exclusively on my iPad. It was a very interesting learning experience, although I miss the color accuracy of my calibrated monitor, it’s a good on-the-go workflow). Little Manatees Are Born To Explore! Here’s another short video I’ve shared on Facebook, Instagram and Vimeo chronicling baby manatee adventures! I think you will find manatee calves and their mothers are not so unlike us, in many many ways?? I’ll have more video to come, but manatee season will be ramping up soon so forgive me if I’m busy underwater observing the precocious little manatees! Baby Manatees Are Too Cute! Baby animals have a particular penchant for being very cute! Little manatee calves rank right up there with the absolutely most adorable junior creatures I’ve encountered! I’d go out on a limb and say they are the “cutest” but I don’t want to upset any other animal moms, especially the mother humpback whales who I witnessed underwater showing off their own offspring a few years ago! Since I upgraded my underwater camera outfit a couple of years ago to the Nikon d7200 I’ve been able to take some nice HD video and my catalog of clips of adorable young manatees is growing. I still have it housed in a trusty Subal underwater housing and their glass dome port works well for video also. Before this camera that produces video I used a GoPro mounted on top of my setup and captured some incredible moments also, although not quite at the quality of my Nikon. Still, my video vaults are bursting at the seams with cute little manatee antics and I want to share them with you. I Have Seen Many Manatee Calves Underwater But “Wrinkles” Is Definitely One Of The Fattest! His Mom Feeds Him Well! Here He Is With Mom, Look At Those Fat Folds Of Wrinkles! Feb. 11th, 2016. Leap Day! It’s a phenomena that happens every four years at the end of February to keep our calendars on point. I look on it as an “extra” or “bonus” day, and who doesn’t need an extra day! ? This Leap Day 2016 I wanted to use my day to go see what the manatees were up to. You may know I had a very lucky Leap Day in 2008 when I happened upon a newborn manatee in front of Three Sisters Springs. But more about that later… See, I also wanted to see the manatees on Leap Day 2012, although it was so hot so early, that the manatees had already skedaddled out of the springs to warmer, more food-rich waters. Thus I was determined to spend February 29, 2016, this recent past Leap Day, observing manatees as I felt it would be another lucky day. I was right! A Female Manatee Is Quite Curious About The Company and Poses Along With A Friend! Three Sisters Springs, Crystal River. Leap Day, February 29, 2016. Hello! I’ve been busy observing manatees this unique January 2016! I say unique because it’s sometimes been sunny and mild, other times very cold and extremely windy. That is a peak time for manatees to seek refuge! After a very warm December, January has turned out to be rather cold and the weather quite volatile. Despite any obstacles I have been in the water to chronicle the lives of our beloved sirenians – as I do every January, although this January it is harder to encounter decent underwater photographic conditions. In these seven examples I have succeeded in different aspects of photographing what I’m interested in and trying new things. There is a “Challenge on Nature Photography” going on right now across Facebook. Usually folks nominate a new person each day. I was nominated, so instead of posting new images for seven days on Facebook, I’m putting seven here and linking to #challengeonnaturephotography. #1 – Mother and Calf Display Affection and Bask In Sun Rays. Wed. January 20th. Sirenians hold many secrets and have for hundreds of years. 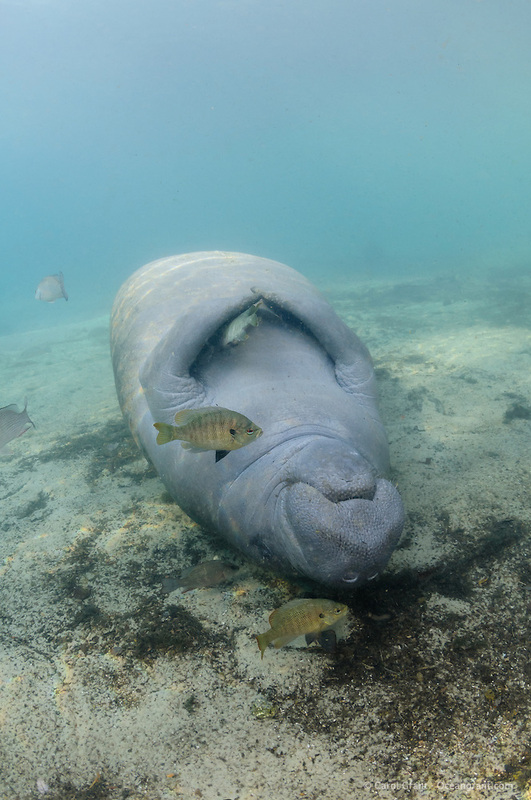 In the wake of the New England Patriots “Deflate-gate” scandal, I went undercover–and underwater–to see what manatees knew about the mysterious deflated footballs. Manatees are experts on buoyancy, bubbles and breathing. They don’t even think about PSI when inflating and deflating themselves, it all comes naturally! Manatees know a lot more than us about what constitutes a hard and a soft football. Here is a photographic lead documented on January 20, 2015. New manatee arrivals, new spring closures to protect the species and new rules intended to help control crowds has everyone talking, including this pair of manatees in deep conversation. Two Manatees Seem To Be Discussing All The Changes Proposed At Three Sisters Springs. From December 9, 2014, Three Sisters Springs. People.com recently posted “The Sexiest Manatees Alive”. You couple that with some great new manatee viewing data, along with my photographs on the VisitCitrus.com site, and a post is in order! I know I said my next post would be about recently arrived manatees, but while I consult with researchers about an unusual behavior I witnessed, here’s some fun manatee buzz! Manatees “sleep with fishes” and they do seem to enjoy it so!